Alabama Crimson Tide head coach Nick Saban already makes more money than any other coach in college football. With a net worth of $45 million, he's easily one of the wealthiest coaches in all of sports, professional or unprofessional. Not that he needs it, but now he has the opportunity to make more than a million dollars in bonus money. Saban signed an extension last summer that pays him $8.3 million per year. But that's just in his base salary. Based on a number of incentives, Saban has the opportunity to make $1.1 million this season. Prior to this new contract, the most Saban could make in bonuses was $700,000. 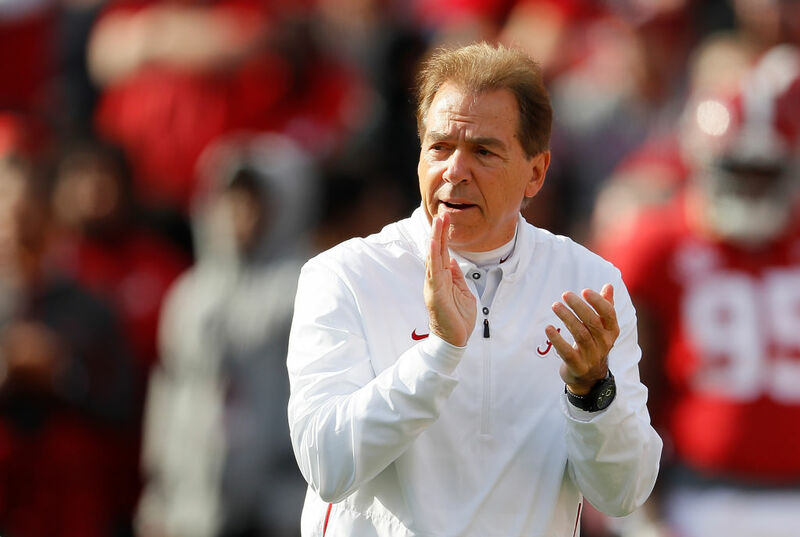 However, with his base salary increased, his bonuses followed – specifically if he once again leads the Crimson Tide to a championship. Saban has already earned $165,000 in bonuses. That total is, in essence, at least $275,000 since it seems impossible for the Crimson Tide to miss one of the six College Football Playoff (CFP) bowl games. Add another $50,000 if the Crimson Tide win the SEC Championship. Saban will make $400,000 for playing in a CFP semifinal game, and $200,000 for each win in the playoffs. If Alabama does indeed bring home another championship, Saban will receive $1.1 million simply from performance bonuses. Other coaches can earn performance bonuses, too. Georgia's Kirby Smart will make $625,000 if Georgia wins the CFP title this year. And Clemson's Dabo Swinney already has $100,000 in the bank, with the potential to earn up to $550,000 more if the Tigers win both the ACC and the CFP title. The Crimson Tide have looked like the best team in college football this entire season. And with Saban's current contract, it's obvious they're paying their coach accordingly. Nick Saban has accomplished a ton on the football field. But he just did something this summer that no coach has ever achieved. LeBron James and Nick Saban both have sports series set in barbershops – and that doesn't sit well with LeBron. Nick Saban is already one of the most decorated coaches in college football history. And this season, he's going to be the wealthiest, too.